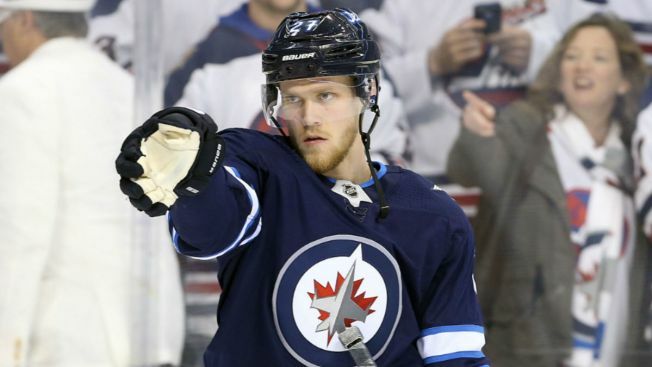 Nikolaj Ehlers had a hat trick, Patrik Laine scored twice and became the fourth-youngest player in NHL history to reach 100 goals, and the Winnipeg Jets beat the Chicago Blackhawks 6-5 on Thursday night. Laine scored his 100th and 101st goals in his 178th game at the age of 20 years, 224 days. Wayne Gretzky did it the fastest in 20 years, 40 days. Jimmy Carson and Brian Bellows also accomplished the feat faster than Laine. The Finnish forward has an NHL-leading 21 goals this season, 18 of them November. Marcus Kruger, John Hayden, Jan Rutta and Domink Kahun also scored for Chicago, and Crawford stopped 27 shots. The Blackhawks are 1-4-0 in their last five games.